Are you ready to be wowed? Welp, I regret to inform you, you’ve likely tuned into the wrong podcast. Or have you? 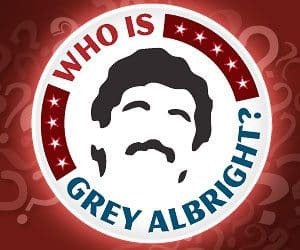 This week we have a big show as Grey and I welcome mutual friend Ian Kahn. You might know Ian from his work over at Rotowire and The Athletic, or you might know him from his rendition as George Washington in AMC’s Turn: Washington’s Spies. Either way you know him! After Ian razzes Grey for 20 minutes we jump in with both feet to the news of the week. We talk struggling pitching, Hunter Dozier, Aaron Nola, Jason Heyward, and many more. If you like baseball and tea sandwiches this is the show for you. It’s the latest episode of the Razzball Podcast. With just a few days to go before opening day of the baseball season we invited Rotowire and Fangraphs Jason Collette to talk about the upcoming season. We hit on Jason’s AL Only Tout Wars draft, talk some Rays breakouts, and new pitches for 2019. If you take anything away from this episode let it be Jason’s Yandy Diaz argument for 2019 relevancy. I bought in and snagged Yandy where I could. Plug in, turn on, and tune out as we take you on another Fantasy Baseball journey of sound. It’s the latest episode of the Razzball Podcast. 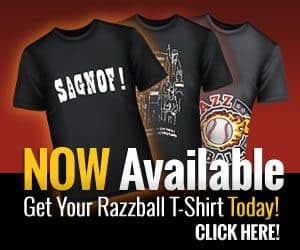 Bee-T-Dubs, don’t forget to order 12 of the new Razzball shirts over on Rotowear.com! It’s been a week since Tout Wars went down in NYC and the boys are bringing on Baseball Prospectus Legend and Albright arch-nemesis Mike Gianella to talk about his AL-Only Tout Wars squad. This is by far the shadiest podcast to date with Grey and Gianella trading barbs almost from the opening bell. We laugh, we cry, we yell at each other about Clayton Kershaw’s value. Most of all however, we trash each others teams. Okay, so this is a bit of hyperbole, but in all seriousness, Grey and Gianella go at each other and it’s all in fun. Don’t believe me? Check it out. It’s the latest episode of the Razzball Podcast. Bee-T-Dubs, don’t forget to order 12 of the new Razzball shirts over on Rotowear.com! Live from New York it’s the Razzball podcast! That’s right, for the first time in our history Grey and myself recorded a show live and in person. This Saturday following the first day of the Tout Wars auction/draft weekend, Grey headed over to my headquarters in Mid-Town Manhattan for a little fantasy baseball talk. We touch on my H2H points league auction results, and finish off the last 40 or so starting pitchers at a rapid pace. It’s an all-time classic for your boys, so check it out! It’s the latest episode of the Razzball Podcast. Bee-T-Dubs, don’t forget to checkout the new Razzball shirts over on Rotowear.com! It’s the end of the beginning today on the Razz pod, as we begin our ascent into the Top 100 Starters for 2019 fantasy baseball. We hit on the aces, we hit on the former aces you shouldn’t draft, we hit on the tiers Grey is targeting, and we talk about ourselves a lot. It’s beautiful, it’s madness, it’s a podcast about 50 pitchers, 29 of them are headed to the DL, the other 21 are coming off the DL. Oops!!! I said DL, pardon me, injury list! Anyway, we talk the top 50 pitchers and a ton of draft strategy. It’s the latest episode of the Razzball Podcast. Alright you chuckleheads, I mean that in the nicest way possible, we’re back to finish what we started. No not the fire in your loins, oh no, we’re here to take you through the rest of the top 100 outfielders. From 51-178 we bring you all the sleepers, guys with two legs, and the occasional player who should have retired 7 years ago but he has 12 kids. So he has to work! Everybody has to work! This is what we love, deep dives on the sleepers that will take you to the ship! Or we just talk to hear the sounds of our own voices. Bee-T-Dubs, don’t forget to checkout the new Razzball shirts over on Rotowear.com!